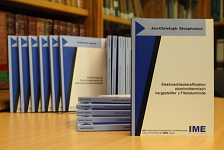 Our whole series of Dr.- thesis can be viewed and purchased at the following link. Search PhD Thesis. Here academic publications of the IME are listed, which are partly available for download as PDF-file. Please note that for technical reasons in some cases the indicated Author sequence might not correspond to the actual order of the article. Authors depicted in blue belong to IME and are followed by external co-authors. In order to view the documents you need the Adobe-Acrobat-Reader. Martin Schwenk, Bernd Friedrich, Demirci; R.; El-Rabati, R.; Robinson, D.; Schlüter, J.
Ernst Worrell & Markus Reuter (Ed. ): Handbook of Recycling - State-of-the-art for Practitioners, Analysts, and Scientists; Elsevier Ltd, Oxford (May 2014), ISBN: 978-0-12-396459-5. p 126 - 150. Manganknollen – zukünftige Rohstoffbasis für Technologiemetalle? Johannes Morscheiser, Srecko Stopic, Bernd Friedrich, Schröder, M.; Zaunbrecher, R.
Andreas Lützerath, Matthias Vest, Bernd Friedrich, Seelmann-Eggebert, H.-P.
Bernd Friedrich, Rodríguez, W.; Pereira, F.; Hernández, C.; Rodríguez, J.
Jackson Rodriguez, Bernd Friedrich, Kölle, U.
Jan Hecht geb. Reitz, Bernd Friedrich, Maurischat, M.
Jackson Rodriguez, Bernd Friedrich, Gobronidze, L.; Rotte, R.; Dott, W.
Titan: Vom exklusiven Material zum Massenwerkstoff? Bernd Friedrich, Hausmann, J.; Gussone, J.; Voggenreiter, H.
Jackson Rodriguez, Bernd Friedrich, Rodriguez, W.; Pereira, F.; Hernandez, C.
Jackson Rodriguez, Bernd Friedrich, Mendoza, O.
Srecko Stopic, Bernd Friedrich, Pavlovic, J.
Jackson Rodriguez, Bernd Friedrich, Krause, G.
Bernd Friedrich, Stopic, S. ; Wigido, A.
Srecko Stopic, Jovic M.; Yutaka H.; Stejic Z.; Seidl T.; Oljaca D.; Kaoru H.
Bernd Friedrich, Gussone, J. ; Hausmann, J. ; Kommer, C.
Jackson Rodriguez, Srecko Stopic, Bernd Friedrich, Krause, G.
Claus Lochbichler, Bernd Friedrich, Jarczyk, G. ; Scholz, H.
Bernd Friedrich, Babyuk, V. ; Sokolov, V.
Semiramis Friedrich geb. Akbari, Bernd Friedrich, Arnold, A.
Bernd Friedrich, Stopic, S.; Widigdo, A.
Jackson Rodriguez, Srecko Stopic, Bernd Friedrich, Schweda, M.
Selective Removal of Heavy Metals from Metal-Bearing Wastewater in a Cascade Line Reactor. Process Metallurgy for High Performance Materials. Berg- und Hüttenmännischen Monatshefte (BHM), Heft 151/1, 2006. Gottstein, G.; Winning, M.; Friedrich, B. Predicting thermodynamic properties in Ti-Al binary system by FactSage. Computational Materials Science, Vol. 37, Issue 3, 2006, S. 355 - 360. Kostov, A.; Zivkovic, D.; Friedrich, B.
Electrolytic recovery of copper from highly contaminated wastewaters. In: Proceedings of the 4th Balkan Conference on Metallurgy, 27. - 29.09. 2006, Zlatibor, Serbien-Montenegro, S. 353 - 360. Intensivierung der Lichtbogenofen-Behandlung von Kupferschlacken durch Einblasen von Koks. Silane Decomposition by Way of Injection into Molten Silicon, Silanzersetzung durch Einblasen in eine Siliziumschmelze. Erzmetall World of Metallurgy, Jg. 58, Heft 6, 2005, S. 337 - 343. Atmospheric leaching of EAF dust with diluted sulphuric acid. Hydrometallurgy, Bd. 77, 2005, S. 41 - 50. Srecko Stopic, Bernd Friedrich, Havlik, T.; Turzakova, M.
Computer Prediction of Thermodynamic Properties for Titanium Based-Alloys. In: Proceedings of the 3rd Symposium of Thermodynamics and Phase Diagrams, 24. Juni 2005, Bor, Serbien-Montenegro. Solubility of CaF2 in NaCl-KCl salt flux for Al-recycling and its effect on Al-loss. In: Proceedings of European Metallurgical Conference, 18. - 21. September 2005, Dresden, Vol. 4, S. 1537 - 1548. Comparative Thermodynamic Predicting in Al-Co-Me (Me=Ti, Mo) System. In: Proceedings of the 7th Conference of the Yugoslav Materials Research Society - YUCOMAT 2005, 12. - 16. September 2005, Herceg Novi, Serbien-Montenegro. Synthesis of particles of Ni- and Co-powders by ultrasonic spray of NiCl2 and Co(NO3)2 and hydrogen reduction pyrolysis. In: Proceedings of European Metallurgical Conference, 18. - 21. September 2005, Dresden, Vol. 2, S. 889 - 902. Kinetics of Al-Li-X Scrap Recycling. In: Proceedings of European Metallurgical Conference, 18. - 21. September 2005, Dresden, Vol. 4, S. 1798 - 1799. Predicting Thermodynamic Activities in Ti-Al Binary System. In: Proceedings of the 37th International October Conference on Mining and Metallurgy, 3. - 6. Oktober 2005, Bor Lake, Serbien-Montenegro. Recovery of submicron cobalt-powder by acidic leaching of cemented carbide scrap. In: Proceedings of European Metallurgical Conference, 18. - 21. September 2005, Dresden, Vol. 4, S. 1725 - 1738. Hydrometallurgical treatment of solid wastes and wastewaters towards an environmental protection. In: Proceedings oft the 6th European Meeting on Environmental Chemistry (EMEC6), 6. - 10. Dezember 2005, Belgrad, Serbien-Montenegro. Neutralization and chemical precipitation of wastewater from Copper Smelters. Titanium Molten Salt Electrolysis Latest Developments. In: Proceedings of European Metallurgical Conference, 18. - 21. September 2005, Dresden, Vol. 4, S. 1495 - 1508. Extraction of Mg from Dolomite. In: Proceedings of European Metallurgical Conference, 18. - 21. September 2005, Dresden, Vol. 4, S. 1802 - 1803. Modelling of Metallothermic Reactions Local Reaction Rates during Aluminothermic g-TiAl-Nb Production. Erzmetall World of Metallurgy, Jg. 58, Heft 2, 2005, S. 63 - 70. Recovery of Cobalt Powder and Tungsten Carbide from Cemented Carbide Scrap - Part I: Kinetics of Cobalt Acid Leaching. Erzmetall Worl of Metallurgy, Jg. 57, Heft 3, 2004, S. 143 - 147. Modellierung metallothermischer Reaktionen - Berechnung der Einsatzmischung unter Berücksichtigung energetischer Effekte. Erzmetall World of Metallurgy, Jg. 57, Heft 4, 2004, S. 217 - 224. Electrochemical reduction of Titanium dioxide thin film in LiCl-KCl-CaCl2 eutectic melt. In: Proceedings of 206th Meeting of The Electrochemical Society, Inc.; Honolulu, 2004. Recovery of Cobalt Powder and Tungsten Carbide from Cemented Carbide Scrap - Part II: Recovery of Submicron Cobalt Powder from the Leach Solution. Erzmetall World of Metallurgy, Jg. 57, Heft 6, 2004, S. 341 - 346. Bernd Friedrich, Georg Rombach, Kieft, R.; Bergstrom, T.; Le Brun, P.; Oygard, A.; Pisch, A.; Ryckeboer, M.; De Schutter, F.; Sillekens, W.
High pressure leaching of nickel lateritic ore "Silcrete". Acta Metallurgica Slovaca, Heft 2, 2004, S. 257 - 264. Sulphuric acid leaching of the nickel laterite ore at an atmospheric and high pressure. Einfluss des Sauerstoffangebots auf die Mitoxidation von Sb und As bei der Sn-Entfernung aus Werkblei. Erzmetall World of Metallurgy, Jg. 57, Heft 4, 2004, S. 197 - 210. In: Proceedings of VII International Conference on molten slags, fluxes & salts, 2004. S. 449 -454. Cape Town, Soth Africa: The South African Institute for Mining and Metallurgy. IME Metallurgische Prozesstechnik und Metallrecycling der RWTH Aachen. Recycling Magazin, Heft 18, 2004, S. 26 - 28. In: V. Papangelakis (Hrsg. ), Proceedings of Pressure Hydrometallurgy Conference 2004 (S. 247 - 259). Banff, Canada: CIM. CaF2 solubility in NaCl-KCl salt flux for alumina recycling. In: Proceedings of VII International Conference on molten slags, fluxes &amp;amp;amp; salts, 2004. S. 197 -200. Cape Town, Soth Africa: The South African Institute for Mining and Metallurgy. Pressure leaching of EAF dust with sulphuric acid. Erzmetall World of Metallurgy, Jg. 57, Heft 2, 2004, S. 113 - 120. Srecko Stopic, Bernd Friedrich, Havlik, T.
In: Proceedings of the Fourth International Conference Kammels’s Quo Vadis Hydrometallurgy, 2004, Herlany, Slovakia; Acta Metallurgica Slovaca, S. 257 - 266. Srecko Stopic, Bernd Friedrich, Anastasijevic, N.
Experimental Design Approach Regarding Kinetics of High Pressure Leaching Processes. Metalurgija - Journal of Metallurgy, Jg. 9, Heft 4, 2003, S. 273 - 282. Srecko Stopic, Bernd Friedrich, Anastasijevic, N.; Onjia, A.
Kinetics of Leaching of the Serbian Nickel Lateritic Ore.
Tsvetnye Metals, Heft 12, 2003. In: Proceedings of European Metallurgical Conference, 16. - 19. September 2003, Hannover, Vol. 3, S. 1350 - 1351. In: Proceedings of European Metallurgical Conference, 16. - 19. September 2003, Hannover, Vol. 2, S. 589 - 610. Sulphuric acid leaching of the Serbian lateritic ore.
Erzmetall, Jg. 56, Heft 4, 2003, S. 204 - 209. Kinetics of high pressure leaching of the serbian nickel lateritic ore. In: Proceedings of European Metallurgical Conference, 16. - 19. September 2003, Hannover, Vol. 1, S. 189 - 204. Packed bed Electrolysis for Production of Copper Powder. Erzmetall, Jg. 56, Heft 11, 2003, S. 668 - 677. Tony Noll, Bernd Friedrich, Budak, I.; Bleck, W.
Kinetics of Sulphuric Acid Leaching of the Serbian Nickel Lateritic Ore under Atmospheric Pressure. Metalurgija - Journal of Metallurgy, Jg. 8, Heft 3, 2002, S. 235 - 244. Cu-Pb-Fe-S-balances in Cu during lead refining. In: Proceedings of European Metallurgical Conference, 18. - 21. September 2001, Friedrichshafen, Vol. 1, S. 295 - 317. Alexander Arnold, Bernd Friedrich, Toubartz, F.
Jahrestagung Aufbereitung und Recycling, 2001, Freiberg. Aluminumrecycling - Anspruch und technische Realisierbarkeit. In: Proceedings of European Metallurgical Conference, 18. - 21. September 2001, Friedrichshafen, S. 32 -33. Behaivour of copper in refining of lead by fractional crytallization. Metallic Raw Material Flows - From Analysis towards Decision Support. IN: Heft 87 der Schriftreihe der GDMB Gesellschaft für Bergbau, Metallurgie, Rohstoff- und Umwelttechnik. Hresg. Jürgen Schlimbach, Georg Rombach, Joachim Krüger, Hausberg, J.; Happel, U.; Meyer, F. M.; Martens, P. N.; Koch, H.; Mistry, M.; Röhrlich, M.
Einbundung von Nutzungsaspekten in die Stoffstromanalyse metallischer Rohstoffe. In: A. von Starck, A. Mühlbauer, C. Kramer (Hrsg. ), Praxishandbuch Thermoprozess-Technik - Band II: Prozesse, Komponenten, Sicherheit (S. 3 - 10). Essen: Vulkan Verlag GmbH. Bilanzierung von Aufarbeitungsverfahren für Stahlwerksfilterstäube. Grundlagen der Kristallisation aus wäßrigen Lösungen. Elinor Rombach, Georg Rombach, Joachim Krüger, Winkler, P.
Verwertung von hochkonzentrierten Abfallösungen durch Kristallisation. Elinor Rombach, Georg Rombach, Joachim Krüger, Gudenau, H. W.; Hoberg, H.; Lukat, R.